As the days go shorter and the nights become cooler, it's important to remain thankful for those in your life that light up the fire within you. This week, we're featuring the Whistler House Museum of Art, Francesca Anderson Fine Art and the Three Stones Gallery which shows that will inspire creativity and love for one another throughout the season. However you're spending the holidays, hold your loved ones close and remain kind and thankful. 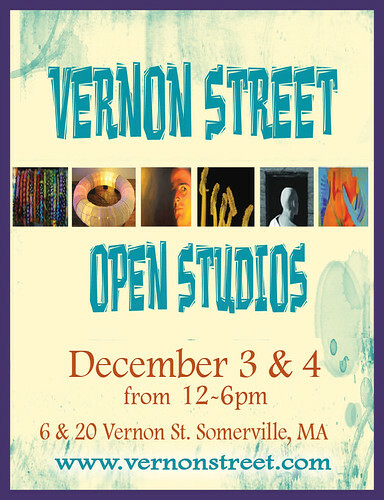 Don't forget to check out the upcoming events we're sponsoring including the Center for Contemporary Printmaking MONOTHON2016 Auction Party on November 19, Society of Arts and Crafts CraftBoston Holiday Show December 2 through 4 at the Hynes Convention Center and the Vernon Street Open Studios on December 3 and 4. Also, we're exhibiting at Art Basel Miami Beach December 1 through 4 where our November/December 2016 issue can be found in the magazine collective booth. Having trouble getting your hands on the most recent issue because of copies flying off the shelves? No worries, because Artscope is now available worldwide in Newsstand for iOS! To find and purchase your own Artscope interactive digital edition, just search "Artscope" in the App Store. Once downloaded, our available issues will show up in your Newsstand. You can purchase new issues as soon as they hit the press or set up a year subscription to guarantee instant access. Plus, don't forget to download the free Artscope mobile app. It is available for iPhone, iPad, DROID & Tablet, and can be downloaded here or in the App store or Google Play. The Artscope app will give you important news, gallery & sponsor listings, live feed of zine posts, current issue excerpts and interactions that make you an integral part of the Artscope universe. Come experience the dialogue that is taking place on our zine right now! Our comment box feature allows you to give your remarks and feedback through your Twitter, Facebook or Google accounts. This is just another way to continue the art discussions that make up the Artscope universe. Also, you can visit the Artscope breaking news feed on the current exhibitions page of our website to see what's happening today through tweets sent directly from your favorite galleries and museums. When you attend an exhibit, after learning about it through the feed, please mention that you saw it in Artscope. As always, information on upcoming exhibits and performing arts events can be sent to pr@artscopemagazine.com, to appear in the magazine or in e-blasts such as this. Want to advertise? Reach us here for more information. To learn more about sponsoring these email blasts, contact us at advertise@artscopemagazine.com or call 617-639-5771. The Whistler House Museum of Art hosts their annual 2016 Fall Juried Members Exhibition now through January 21, 2017. 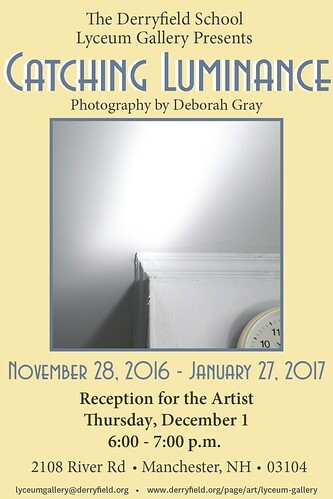 The show features works from 110 artists from the Lowell Art Association, Inc. with varying style, subject matter and mediums. Jurors Glenn Szegedy and Lynne B. Mehlman critiqued over 250 submissions based on technique, composition, perspective and originality and ultimately selected 70 works to include in the show. The works range from photographs, sculptures and paintings and include works from varying perspectives that make the Fall Juried Members Exhibition truly unique. Artists include David Jones, Art Ferrier, Lisa Kovvuri, Martha Wolfe and William Galvez, among many others. The difference in artworks make the collection intriguing to any visitor. 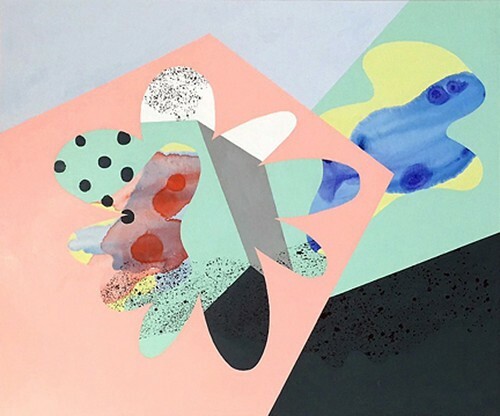 Lisa KovvuriDavid Jones creates more abstract pieces with bright, bold colors. Martha Wolfe captures works similar to impressionism with softer edges and more subdued tones and Art Ferrier uses photography to capture poetic moments in every day life. Sara Bogosian, President and Executive Director of the gallery, notes "We were overwhelmed and impressed by the number of fine works that were submitted.. 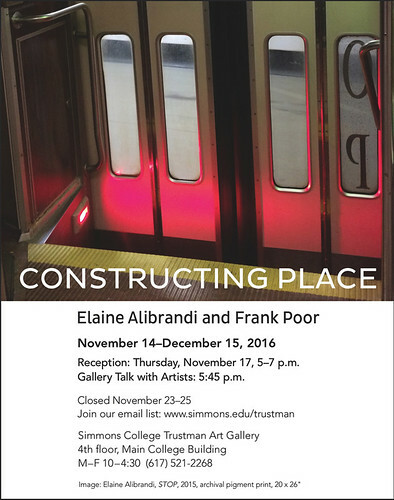 I believe our viewing audience will be intrigued and elated by the range of works that are a part of this exciting exhibition." The 2016 Fall Juried Members Exhibition is on view at the Whistler House Museum of Art in Lowell, Massachusetts now through January 21 with an opening reception on Saturday, November 19 from 2 p.m. to 4 p.m. For more information click here. Meet this extraordinary curated collection of 175 painters, potters, sculptors, jewelers, photographers, furniture makers, clothing designers and more - from every corner of America. 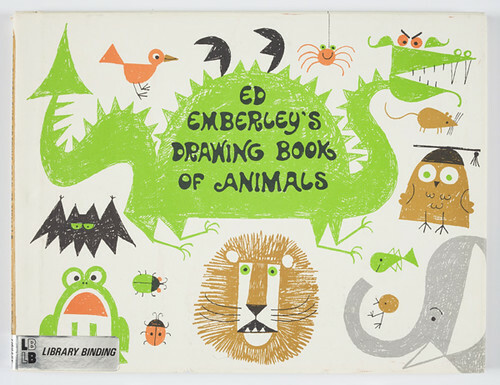 This first museum retrospective of Massachusetts artist Ed Emberley draws on his personal archive of original hand-drawn sketches, woodblock prints, final proofs, and first edition books to survey his career and examine his influence on generations of readers and nascent artists. Opening Family Weekend: November 19 & 20--Includes book signings by the artist. 38th Putney Craft, Food & Stage Thanksgiving Weekend: Top 10 Vermont Winter Event, Nov 25, 26, 27 (10-5). Blacksmiths, glass blowers, potters, jewelers, weavers, woodworkers, custom bicycle maker, artisan wine & cheesemakers. One-of-a-kind gifts. Buy direct. It's fun. It's free. Theater events at night. Food Specials at local participating restaurants. Available worldwide on your iPad instantly receive new issues and interactive bonus features such as pan and zoom images, special elements, on-the-go format and a hands-on table of contents. Get a 30-day free trial with your subscription, plus receive over 50% off print edition prices. Search Artscope in your App Store. With Artscope in Newsstand, current art news and coverage is available anywhere, anytime, right at your fingertips. Francesca Anderson Fine Art hosts 52 artists during their current exhibition. The 32nd Annual Almost Miniatures Show is on view now through January 14 in Lexington, Massachusetts and features many artists who work in different styles. It's never too early to begin looking for unique holiday gifts and Francesca Anderson Fine Art hosts an opening reception tonight, Thursday November 17, from 5 p.m. to 7 p.m. and invites viewers to experience the gallery and immerse themselves in the holiday joy. The pieces shown range from abstract, impressionist and digital art. The gallery has recently revamped their layout and design in order to make the art stand out more dramatically. Over 200 small paintings and prints are on display throughout two floors of the gallery and each artist, whether new or returning, brings something different to an overall cohesive show. 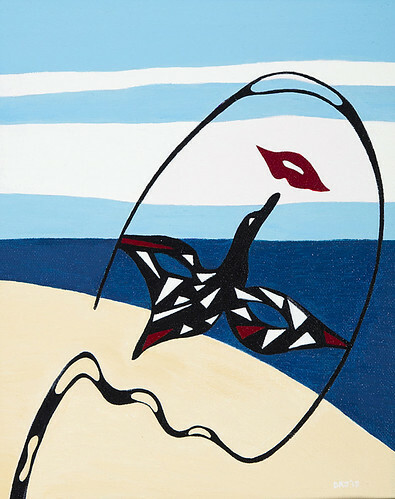 Artists from across the country exhibit their work, from Maine, Maryland, Massachusetts, Connecticut and Oregon and elsewhere. 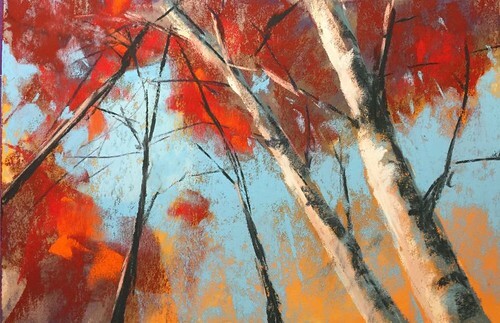 Featured artist Dave Kaphammer works primarily in pastels in order to create impressionist details of nature in order to capture the beauty and personality, Will Sillin works with watercolors to depict realistic sunsets and other nature-scapes and Sirarpi Heghinian Walzer uses mixed media and encaustic to create unique collages. In addition, popular artist Maris Platais will be demonstrating his technique to viewers on Saturday, December 3 in pen, ink and acrylic painting. For more information on 32nd Annual Almost Miniatures Show and the Maris Platais demonstration click here. The Three Stones Gallery is getting into the spirit of the holidays with their holiday show Color, Grace & Passion. On view through January 13, this show is perfect to view with your loved ones on those cold evenings. Color, Grace & Passion features artists Jim McManus, Tim Dunnbier, Siri Smedvig, Adria Arch, Ken Irwin, Marv Goldschmitt, Bob Hale, Gwen Murphy and Toby Kopman. The works include paintings, vintage concert photos, hand-turned wooden bowls, mixed media works and a smaller collection of handmade jewelry and note cards by artists from the area. Owner Jennifer Montgomery Johnston recognizes the depth that comes with the changing of the seasons and the physical darkness of this time of year. "This show is about the richness, beauty and mystery of this darkening time of year, as well as the holiday season.. It's a time we draw inward to appreciate the places and spaces of light, warmth, music and inspiration." 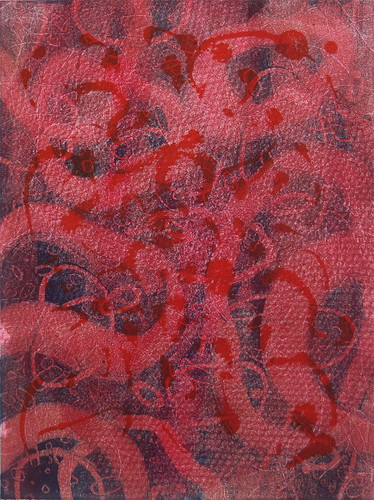 The artists' work demonstrates a variety of ideas and emotions. Jim McManus creates abstract pieces meant to convey emotions related to people or experiences where Marv Goldschmitt captures that moment through vintage concert photos of Arlo Guthrie, Leon Russell and Ronnie Earl. 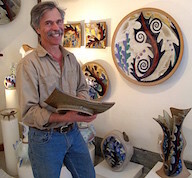 Bob Hale has a somewhat more practical approach to art, creating hand-turned wooden bowls both beautiful and functional. In addition to mixed media works by Murphy and Kopman, jewelry and hand made stationary is included in Color, Grace & Passion. Three Stones Gallery hosts an opening reception tonight, Thursday November 17, from 6 p.m. to 8:30 p.m. that includes music by award-winning jazz guitarist Steven Kirby. For more information click here. The perfect place to do your holiday shopping! 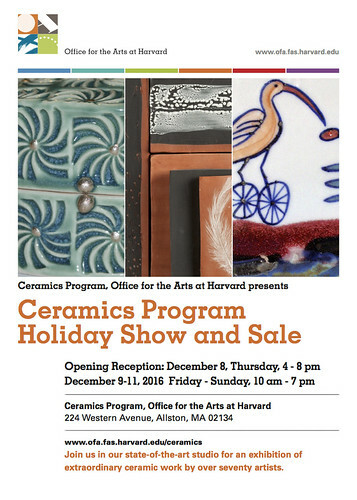 Support local artists working in clay at our annual Holiday Show and Sale. 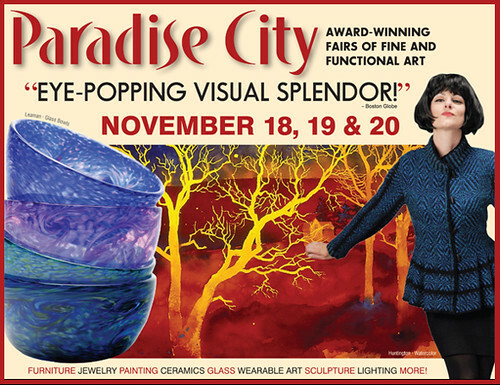 From functional dinnerware to sculptural masterpieces, this popular exhibition has something for everyone. Friday, Saturday, and Sunday, December 9, 10, and 11, from 10:00 am - 7:00 pm. 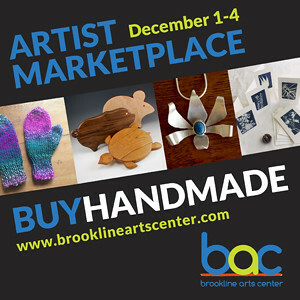 The Brookline Arts Center's annual holiday show and sale features handmade crafts and fine art from area artists. This year we have jewelry, pottery, original prints and cards, woodwork, home goods, knitwear and more. Shop local and discover unique gifts for all ages and interests! More information. Market Hours: All market hours are free to attend! To view all images, "view images" may need to be enabled on your browser. 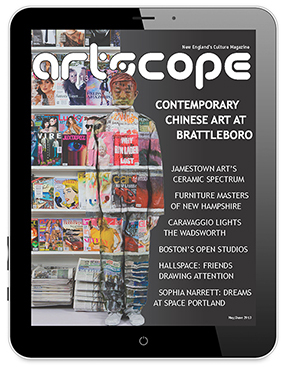 Pick up artscope magazine at any of hundreds of museum, gallery and university locations across New England! Where to pick up a copy.